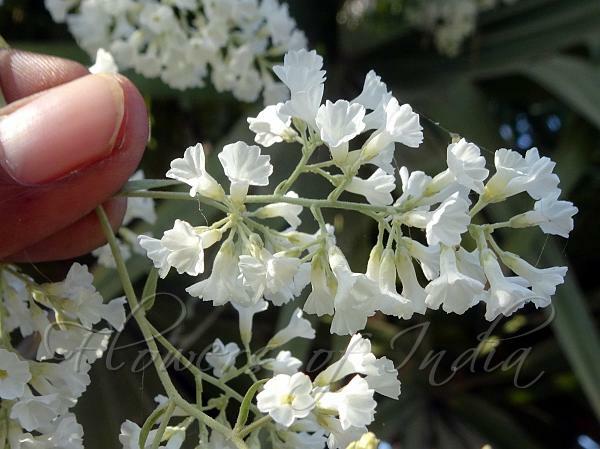 Bridal Bouquet is a climber from the Himalayas, cultivated widely in South India. The stems are herbaceous at the tips, woody at the base, grayish velvety. Leaves are ovate-heart-shaped, 4-9 cm long, blunt to long-pointed, velvety on both surfaces. Flowers arise laterally or at branch ends, in panicles or racemes. Sepals are linear, 1-1.5 mm long, densely velvety. Flowers are white, funnel-shaped, 5-6 mm long. Fruits are ovoid-round, 5-6 mm long, the outer 3 sepals enlarged and wing-like. Seeds are ovoid, brown. 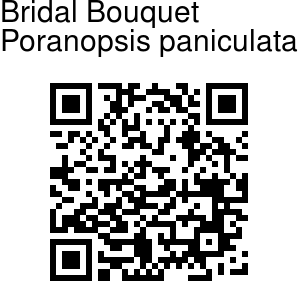 Bridal Bouquet is found in the Himalayas, from Pakistan to NE India, at altitudes of 180-1990 m. Flowering: October-March. Identification credit: Monideepa Mitra, Amit Kumar Photographed in Chandauli, UP & Sahastradhara, Uttarakhand.